G.V. Knyshov, V.M. Kovalenko, V.V. Lazoryshynets, K.V. Rudenko, Ju.V. Davydova, L.M. Prokopovych, S.O. Siromakha. The current situation and prospects of development in emergency and urgent cardiac surgery and interventional cardiology in Ukraine. Factors influencing blood pressure control in hypertensive patients depending on age. C. Farsang, on behalf of the PICASSO. Efficacy and tolerability of fixed-dose combination of perindopril/indapamide in type 2 diabetes mellitus: PICASSO Trial. V.M. Kovalenko, E.G. Nesukay, E.Yu. Titov, N.S. Polenova, O.O. Danylenko. Optimization of the diagnosis of heart failure with preserved left ventricular ejection fraction in patients with essential hypertension using speckle-tracking echocardiography. V.S. Tanasichuk, S.V. Fedkіv, T.M. Babkinа, N.V. Tanasichuk-Gazhieva. Role of modern methods of cardiovascular imaging in the assessment of left ventricular remodeling in chronic forms of the ischemic heart disease. Thrombogenic milieu in patients with atrial flutter. Correction of mitral insufficiency of the ischemic origin and prevention of heart failure. O.V. Sinyachenko, G.S. Taktashov, M.V. Iermolaeva. Cardioprotective and cardiotoxic trace elements in chronic rheumatic heart disease. O.I. Mitchenko, V.Yu. Romanov, G.Ya. Ilyushina. Dyslipidemia and surrogate markers of atherosclerosis in patients with essential hypertension, physiological and post-surgery menopause. O.Yu. Kulyk, O.I. Mitchenko, V.Yu. Romanov, L.V. Yakushko. Leptin resistance and cardiovascular risk in patients with essential hypertension and metabolic syndrome. Yе.P. Svyshchenko, L.A. Mishchenko, on behalf of the trial «Age of vessels» participants. New concept evaluation of cardiovascular risk by Framingham criteria – determination of the age of vessels. 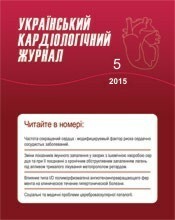 The first experience in Ukrainian population of patients with arterial hypertension. M.M. Dolzhenko, L.Ye. Lobach, S.V. Potashev. The influence of gene polymorphism of aldosterone synthase (CYP11B2) on the cardiovascular system. О.М. Parkhomenko, on behalf of the physicians – participants of the project «Territory of Safety». The prevention of venous thrombosis and embolism in non-surgical patients: the current state of the problem, possible solutions in Ukraine. Results of the project «Territory of Safety».